This pink midi has been in my closet for what feels like a long time but, I go through a love/hate relationship with it. Sometimes, the bright and bold pink makes me feel playful but other times, the bright and bold pink can be ostentatious so I like to tone it down a bit. On this day, it was the latter and I went with black accents. Pink + black is so mind-blowing isn't it? i feel like this is the perfect city outfit. if it gets too hot you can take off the jacket and skirts are nicey and breezy and then obviously it can be warm as well. love that color on you! You styled it perfectly Nancy! I love that skirt length and color. This look is so chic, i love how you paired the bold skit with neutral classic pieces! I must say I'm in love with your style. So chic! Love the pleated midi skirt style! It looks great and edgy paired with that moto jacket! Great style! Nice outfit. I love the pop of color from the skirt, and the leather jacket gives it that edgy look! I really like the skirt but can't do this length myself, I'm too short and not slim enough. Love it on you! I love how you styled this bright skirt with the leather jacket. Perfect for transitioning into fall! This is the cutest outfit! You rock that midi skirt. Pink and black is the best! such a fun look. 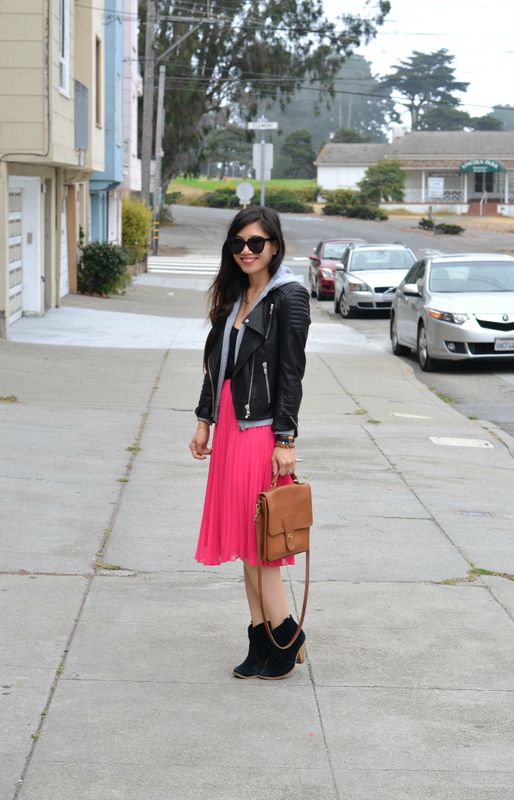 I love the hot pink midi paired with the moto jacket and booties. Also, love the Coach Willis. i adore that shade of pink. you look too cute! Great outfit! I love your skirt!! LOVE your skirt!! It's so fun and pretty! I love this! It's sweet, but edgy. The skirt is fabulous. i like the way you styled it. i love the pink and grey combo as well! Love your skirt, the color is so pretty!